Why I Read It: Goodreads College Student's group read! I'm not sure I would have ever picked up this book if it hadn't been a group read. I think it was really the Oprah's Book Club sticker on the front, which would have revealed to the world that I had succumbed to the masses (Oprah and I have a love/hate relationship). Nevertheless, I'm so glad I did. Middlesex is a fictional story of a man named Cal Stephanides with a condition called 5-alpha-reductase deficiency...aka, he is a hermaphrodite. He was raised as a girl (called Calliope), but never hits puberty. That raised questions, and when he learned of his 'condition,' Cal instantly accepted and adapted himself as a boy. He basically walked out of the door, shed his girl clothes, got a haircut, and was a boy. I'm getting a bit ahead of myself here, as Cal's story and transformation is really only the last third of the book. In the previous pages, we meet his peculiar and unforgettable family. The first part of the book is about his grandparents, Desdemona and Lefty. We learn about the beginnings of their extremely odd relationship and their emigration to America after fleeing the 1922 Greek/Turkish war. In the second part, Desdemona and Lefty are assimilating into American culture and trying to survive in their new country. Cal’s parents, Tessie and Milton, also come into the picture against a backdrop of economic troubles and race riots in Detroit. Finally, Cal makes his entrance in 1960, only as a little girl. We follow Cal throughout the rest of the book as he grew up, went to school, made friends and was a seemingly normal girl. It was only until he was around 10-11 that things started to get tweaky. In my opinion, that’s where the book really hits its stride and takes off. The author does not mince words or gloss over the details. We read every detail of Cal’s awkward encounters with both males and females, his body parts, and other’s thoughts on his condition. The reader is told all of this by a middle-aged Cal, written in a memoir form. The remembrance of his life brings us and Cal a fresh new perspective. One of my biggest problems was that the Calliope/Cal transformation is so abrupt that I felt it lacked any emotion. The rest of Cal’s experiences are filled with emotion and personal insight, but this big change almost came out of nowhere. It was hard for me to understand why he accepted this change so easily. Also, the author has a thing with names, or a lack of names. Cal’s grandfather is named Lefty, his brother is Chapter Eleven, and Cal’s friend/source of infatuation is only known as ‘The Object.’ Unknown/unexplained nicknames are a pet peeve of mine. Middlesex is not your typical coming of age story. It is extremely awkward in places and sometimes difficult to think about. Even though it's fiction, it's still very real. 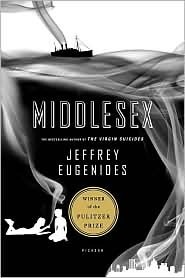 Jeffrey Eugenides is a great writer and has developed an interesting plot. Even though this is not the type of book I would typically read, I enjoyed it immensely. 4 stars. I was not a big fan of this one. I do agree it isn't the usuak coming of age novel which I really liked. Hm...I'm not sure. I've been on the fence about reading this book. We'll see. But I'm glad I read your review because it provided me with quite a bit more information on this. I purchased this book such a long while ago and still have not read it. I must get to it. Thanks for your review! This has been on my TBR shelf for as long as I've been a member of goodreads, and I STILL haven't picked it up. Hopefully your review were spur me in the right direction! I read this a couple summers ago and was pleasantly surprised. I think Eugenides writing style was really what kept me hooked on the story. I'd recommend any of you who are on the fence about this one, definitely give it a try! I've owned this book for about a year! I need to get on it!! Great review! I recently made a list of Pulitzer books that I want to read. Initially, this one did not make the cut but later, for what reason I'm not really sure, I had second thoughts and tacked it on. Glad to read your review as it's an affirmation that it'll most likely be a worthwhile read. I know what you mean about those OBC stickers - they usually scream "stay away!" to me too! I really enjoyed this one. I thought it was just such a unique book, and is extremely well-written! Have you read his other book, The Virgin Suicides? That one's pretty good too. I was surprised by how much I liked this book. Haven't read anything else by Eugenides but keep meaning to go back to read Virgin Suicides since I liked this so much! I read this book 4 or 5 years ago and it's really stuck with me. I'm always amazed by how many political issues Eugenides manages to pack into the book without it ever feeling like the characters or the narrative is up on a soap-box screaming at you. The only "difficulty" I've run into with the book is how to recommend it to others- so many people get squeamish at the notion of reading about the controversial themes of the story. It took me about 4 weeks to write this review, because like AliBird says, it's full of a lot of issues and points. I wasn't sure what to include and leave out. It is so well written that I say to those of you on the fence, go for it! Kelly--I remember you saying how hard this review was for you to write and that it was taking you forever! You did a really great job! I'm honestly moving it up on my list. I'm in need of a complex novel! I am doing a partner read of this with a friend from Twitter very soon. Your review makes me very very excited for this read!! I love, love, love this book. I read it for the group as well and was surprised by how much a lot of people disliked it. One of my favorite books ever. I really loved Middlesex. It was one of those novels that I was really sad to finish. As convoluted as the family history may have been; I felt like I was apart of it because of his dedication to detail. I'm glad that you mentioned the abrupt transformation of Cal's character. Perhaps Eugenidies uses this quick transformation to emphasize the impact of such a realization, or even the naturalness of the complete lifestyle change, as in the character feels that this is the natural decision. I wasn't entirely clear, but I felt the change to be intentional, and not simply a case of ending the novel. Perhaps, it was looking back on this expeience that the character felt it was so rushed. There are a million different theories, but I like that you addressed the topic, because I had my qualms with it, as well. I really liked this book. It was epic, but it wasn't necessarily plot driven. There were a couple times that I was like, Ok thanks for the history lesson. Can we move on please! You think it's going to be all about this person's transformation from girl to boy, but really that's a small part of the story. All in all it's a unique story and very well written. It would be nicer if the author had maybe indicated how she got the photos, i.e. did she take them herself, and/or did she grow up on a farm, or ? The formatting of the book was not too bad. No misspellings were noted. It would have been better to center the sentence under each photo like was done on the first photo but not the later photos. One photo had the sentence starting on the right side of the photo. The first sentence also did not have a period at the end of it.